Every election, I went with my mom to vote. I remember times when she said she might not have time with her busy work schedule and I’d get mad, telling her she had to do it. I’d nag her until she finally took me, right before the polls closed at night. Four years ago, it rained on election day. I remember what I was wearing – black pants, a blue shirt, and my black rain jacket. I was so excited to be voting in such a historical election. I was late to work for the first time that day; the assistant principal had to cover my class for the first few minutes. I was frazzled, but glad I could wear my sticker and show my students I had voted. That night, my then fiancé and I sat in our living room and watched as President Obama and his family celebrated his victory in Chicago. We sipped champagne and I cried. Since then, we’ve gotten married and had our first child and our lives are so different, but so great. This morning, I got up early and walked with Liam in his carrier to the church down the street to continue the tradition and fulfill my civic duty. 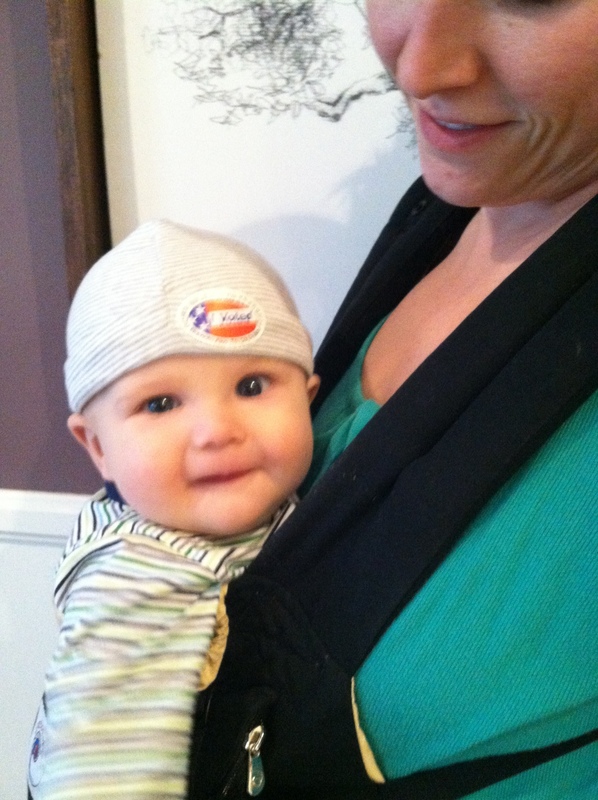 Whatever the outcome this year, I’ll continue to show my son that voting is something that is important to me and bring him to the polls so he can see for himself our democracy in action.